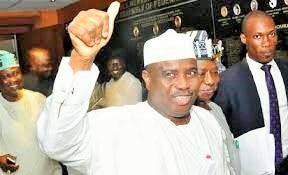 (News Investigators) /Governor of Sokoto State and Presidential hopeful of the Peoples Democratic Party (PDP), Aminu Waziri Tambuwal, has said that his government would help Nasarawa State achieve her full potentials as a solid mineral-endowed state, if elected president of Nigeria. A statement by Tambuwal Campaign Media Office, Saturday, signed by spokesman, Okey Ikechukwu, said the also aspirant promised not to pay lip service to the development of the state as successive governments had done but will carry the state along and ensure that it benefits from its strategic position. He added that he plans to boost the economy of Nasarawa, by directing investment into the state saying, “The time has come to convert the proximity of Nasarawa state to the seat of the Federal Government, Abuja, into real economic and developmental gains for the people of the state. “I am here today to tell you that the privilege of proximity to the seat of power will give you the reward of deserved gains under my leadership”, Mr. Tambuwal assured. The presidential contender, who was also Speaker, House of Representatives, promised that his administration will bring comprehensive and lasting solutions to the menace of farmers/herdsmen violence in the Nasarawa/Benue axis if given the opportunity to serve as president by adopting a specific framework for the area that will identify the root of the challenges and deal with them comprehensively. He noted that the framework that would work in Nasarawa or Benue may not work in Zamfara or any other state, adding that his government will not adopt a “one solution approach of the current government, ”which he said has failed to bring lasting peace. Mr. Tambuwal said that if given the opportunity to succeed President Mohammadu Buhari, “Nigeria will have a leader that will make the her proud in the comity of nations, “a leader that has the credential of togetherness, visionary leadership, bridge-building and a leader that will not take decisions shrouded in ethnic and religious biases. “From my experience and exposure and broad world view, and having visited and interacted with people in all the 360 federal constituencies, as Speaker, I have full understanding of the complexity of Nigeria’s unique diversity. And I know that our strength is in our diversity. But we need a leader that has the ability, understanding and willingness to unify this great nation and bring her to the path of peace and progress because Nigeria has never been this polarized along ethnic and religious lines. We must say no to clannishness. Nigeria belongs to all and everyone has the right to live and prosper in any part of the country without fear,” Mr. Tambuwal said. Responding on behalf of the delegates, one of Tambuwal’s former colleagues in the House of Representatives, who hails from Nasarawa, Mohammed Ogushi, extolled Tambuwal’s leadership credentials, describing him as a credible leader.